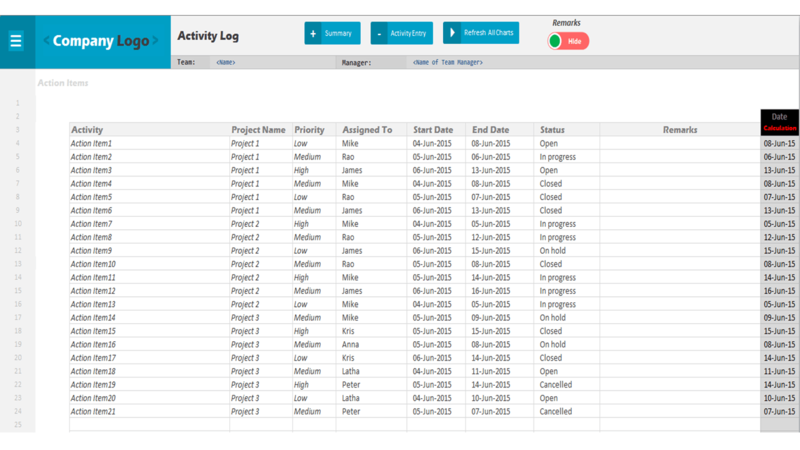 Activity log helps to track daily activities of a project or all activities which are executing by a person. 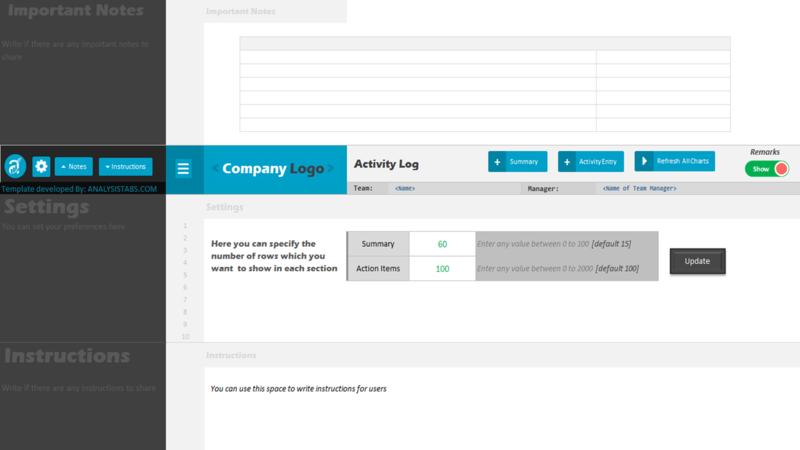 Activity log template helps to see the status of the tasks or projects. While executing any project it is good practice to maintain an activity log to keep eye on all the activities which are executing by a person or team. There are many advantages using an activity log, we can know the all the activities and its status and how they are progressing. It helps an individual to communicate the status of all tasks to reporting manager or client or stack holders. It helps an individual to see whether is able to complete all tasks based on priority. We have variety of options to capture the data, summarize and visualize the reports. User have to capture the data for the following fields:Activity Name, Project Name, Priority, Assigned To, Start Date, End Date and Status. The reports will be automatically populated. Overall summary: We can see the overall summary of all tasks. i.e, number of open tasks, number of tasks in progress, number of tasks closed, total tasks on hold and tasks cancelled. We can also filter the charts by Project Name and person to see the overall summary of a project or an individual person. Total Activities: This chart will give you overall activities and plot by each person which shows number of activities assigned to a person. Activities by Project/Person: This chart will show you all the activities by status and we can also filter this chart by project or by person. 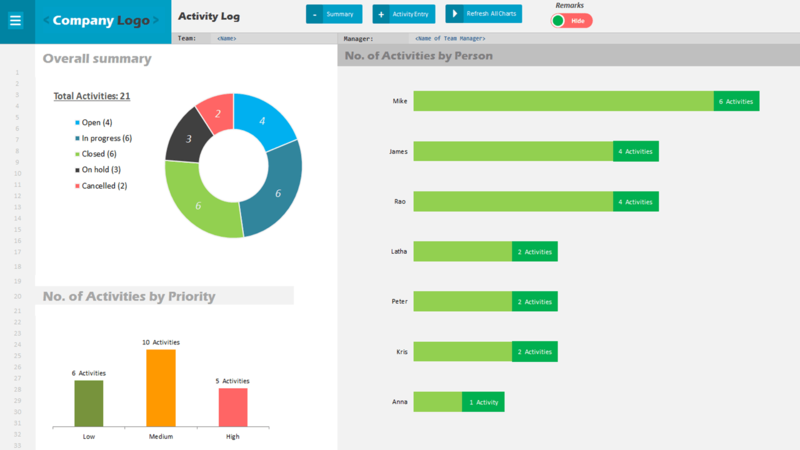 Activity Priority by Project/Person:This chart will show you all the activities by priority and we can also filter this chart by project or by person. Activity Status By Date: we can see number of activities by date. we can also drill down this chart by project name,by person name, based on priority and based on project status. Activity Status By Day: we can see number of activities by Day. we can also drill down this chart by project name,by person name, based on priority and based on project status. 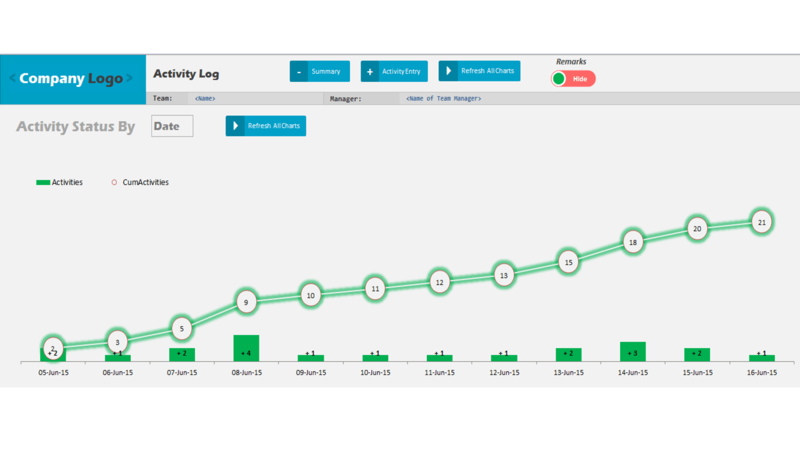 Activity Status By Week: we can see number of activities by Week. we can also drill down this chart by project name,by person name, based on priority and based on project status. Activity Status By Month: we can see number of activities by Month. we can also drill down this chart by project name,by person name, based on priority and based on project status. Activity Status By Year: we can see number of activities by Year. we can also drill down this chart by project name,by person name, based on priority and based on project status. Once you update or modify the data or add new tasks you can click on the refresh all charts command button to see the updated charts or visualizations. You can use remarks fields to capture any additional remarks on each action item. You can select the remarks checkbox to show or unselect to hide it. You can use the settings area to change the default areas of each section.